I found myself in need of a better mouse trap. We had (had :P) a very clever mouse. Each night for about a week our “ninja mouse” would take the bait off the trip pan without tripping the trap. I remember once, long ago, my Dad tied some cheese to the pan. I tried that but this mouse was too smart for that. He just ate through the string! Being an Engineer I know I could do one better. 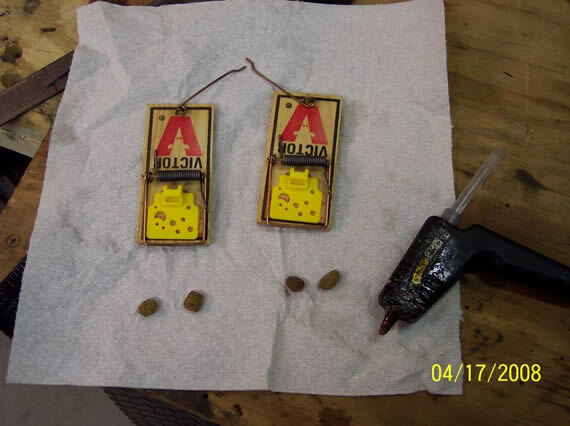 A little hot glue a bit of dog food and BAM, you have a ninja proof mouse trap. That night was the mouse’s last night on earth. We don’t normally have mice and we have not seen another since, but I’m ready if any want to try me out again. You are currently browsing the ToddFun.com blog archives for April, 2008.